A new service aims to be the Google search of underground Web sites, connecting buyers to a vast sea of shops that offer an array of dodgy goods and services, from stolen credit card numbers to identity information and anonymity tools. A glut of data breaches and stolen card numbers has spawned dozens of stores that sell the information. The trouble is that each shop requires users to create accounts and sign in before they can search for cards. Enter MegaSearch.cc, which lets potential buyers discover which fraud shops hold the cards they’re looking for without having to first create accounts at each store. This free search engine aggregates data about compromised payment cards, and points searchers to various fraud shops selling them. According to its creator, the search engine does not store the compromised card numbers or any information about the card holders. Instead, it works with card shop owners to index the first six digits of all compromised account numbers that are for sale. These six digits, also known the “Bank Identification Number” — or BIN — identify which bank issued the cards. 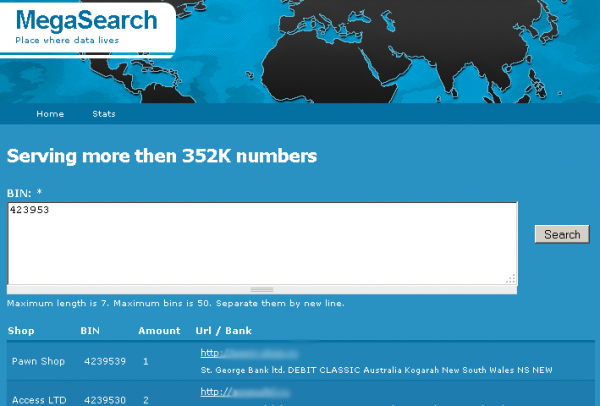 Searching by BIN, MegaSearch users are given links to different fraud shops that are currently selling cards issued by the corresponding bank. I first read about this offering in a blog post by RSA Fraud Action Research Labs. It didn’t take much time poking around a few hacker boards to find the brains behind MegaSearch pitching his idea to the owners of different fraud shops. He agreed to discuss his offering with me via instant message, using the search service as his screen name.